Hope's Cafe: SGSG-Cafe Press Review and Giveaway!! I've said it many times before, but I absolutely love shopping at Cafe Press! There is such a huge assortment of gifts; not just the type (clothing, decor, drinkware, accessories, etc.) but also an enormous variety of subjects and themes! You can find a gift to suit anyone at Cafe Press. I was given the opportunity to choose a couple items for review, and I decided on a personalized polo shirt for my brother, and a pre-designed shirt for myself. After placing my order, I was anxious to see how the shirts actually looked, but as always, my Cafe Press package came in quite promptly. I also had a lot of fun designing my brother's custom golf shirt, and went through many shirt styles and colors before settling on the white polo. 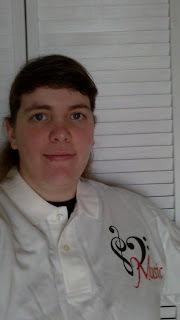 (E prefers wearing collared shirt while out and about). With the polos you can choose either a pocket or back design, and since what I had in mind is rather lengthy, I went with the back. I uploaded a JPEG of my design, which is simply the chorus of my brother's favorite song typed out, and Voila! The shirt was ready for printing! I am very pleased with how well it looks! If you're looking for that perfect gift this holiday season, be sure to check out Cafe Press-you can find something for anyone and everyone there! on Cafe Press! Use this to shop for a t-shirt, personalize a gift, or for anything else on the Cafe Press website! I would get mybrothers the retro nick tees - like rocco modern life, hidden temple, camp anawanna! I would like to give A Reindeer Named Rudolph Pajamas. My husband was a Marine. I would like to get him a Marine hoodie for Christmas. I would like to give the Spay Neuter Rescue Love shirts to the rescue I volunteer for. Would love to get the Bengal Cats wall calendar for my husband. I would love to get Florida bumper stickers for my parents who finally retired! I would like the Merry Christmas Characters T shirt. It is so cute. I would love to gift the Breast Cancer Words Flip Flops and the Peruvian Babe Pajamas for xmas. I would love the "Cool Aunt Pajamas". My son loves puzzles and I would like to get him the Photo Puzzle! I like the Look After My Heart Necklace. Didn't realize they had necklaces:) Thanks! I like the Martial arts Gym Bag. I think it would be neat to design my own iPod case. SO neat! Thanks for the chance.